A Pembrokeshire coach company has been placed into administration, with the loss of more than 40 jobs. Despite attempts by administrators to secure a buyer, Silcox Coaches has now ceased trading after 134 years. The Pembroke Dock-based firm, which provided school transport, local bus services and tours, had experienced financial difficulties. About 50 staff have been re-employed by Edwards Coaches, which took over the school transport contracts on Monday. People who have booked and pre-paid for a holiday with Silcox may be entitled to a refund and should contact either Bonded Coach Holidays or The Confederation of Passenger Holidays UK. Pembrokeshire council said most public buses ran as normal with different operators after other businesses stepped in to fill the gaps. The 357, 362, 371, 375 and 380 services are not currently running and the council said it was trying to find new companies to run these routes. 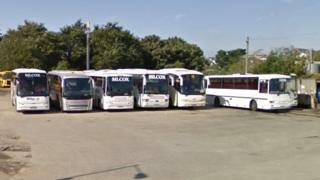 Kelly Burton, director and insolvency practitioner at Wilson Field, said Silcox Coaches was a fourth generation bus and coach operator which had an "excellent reputation within the industry". "Initially there were a number of parties interested in buying the business and assets and we had hoped to save all the jobs of the loyal workforce," she said. "Sadly, despite our best efforts none of these came to fruition. On the positive side, Edwards Coaches of Pontypridd have re-employed approximately 50 of those staff." Edwards Coaches is the largest family-owned coach company in Wales employing over 500 staff and operating 260 vehicles.